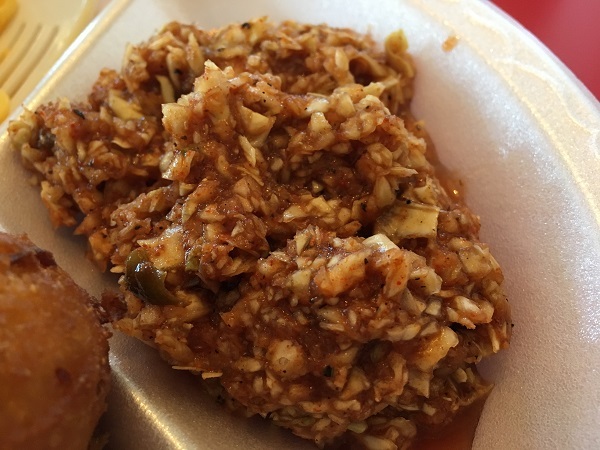 Bears Den BBQ, Ocoee TN – Marie, Let's Eat! 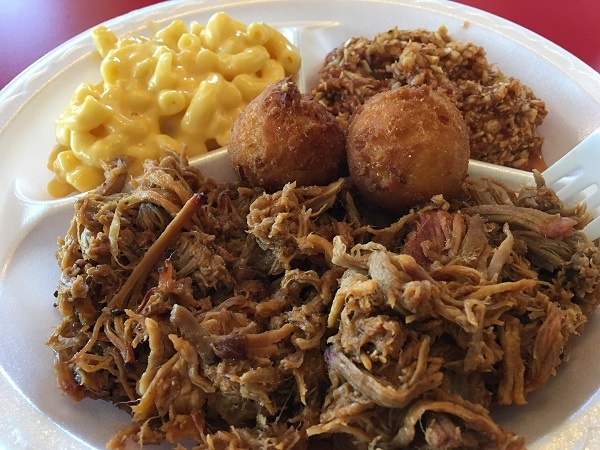 Popular with rafters and hikers and very, very busy during the summer months, this place serves barbecue that seems to be more in line with what we know about the North Carolina mountains than with eastern Tennessee, and offers a powerful secret weapon in its hot slaw. Toward the end of January, Marie and I had a weekend to ourselves and enjoyed an early movie and then a long drive for lunch. I’ve talked often in this blog’s pages about the differences between barbecue in Georgia and eastern Tennessee, and here’s another huge one: there’s a lot less of it up here. If you dig back in our archives, you can see that in the spring of 2016, she and I made several looping day trips, catching quite a few barbecue places in the middle of nowhere, including a few that Google hadn’t thought to show us. I had hoped that we’d make similar roadside discoveries up here, and so we made our way to the small town of Ocoee via TN-317 and TN-60, but we didn’t find any businesses whatsoever along these lazy roads. Very nice scenery, just no barbecue. About an hour later, having skirted around Cleveland, we found the outskirts of Ocoee and joined one other party in a restaurant that normally hosts far, far more people than were there today. 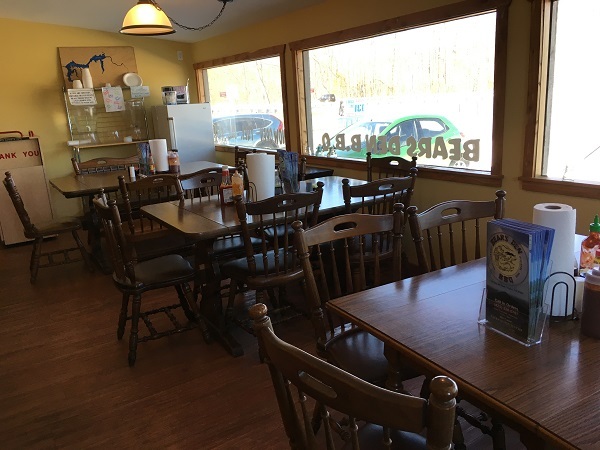 Bears Den BBQ is said to be extremely popular with the whitewater crowd, and they have a big, covered outdoor seating area for diners by the busload. We were surprised by one note of our meals. In a region where almost all the barbecue is prepared and served the same way, Bears Den is the first place that we’ve visited in ages to keep the meat simmering in a little sauce in a steam tray. You see this in several places in South Carolina, where it’s a mustard-based sauce, or in middle Georgia around Macon, where a different style of mustard-vinegar is used. Simmering in a sticky-sweet tomato-based sauce is pretty uncommon. Troy’s in Rome GA does something similar to this, and so does Herb’s in Murphy NC. Noting what the owner had said about how popular they are during whitewater season, and looking over their deep menu of please-a-large-crowd offerings, I was also reminded of Herb’s. I pulled it up on my GPS and saw that it was only half an hour from Ocoee. 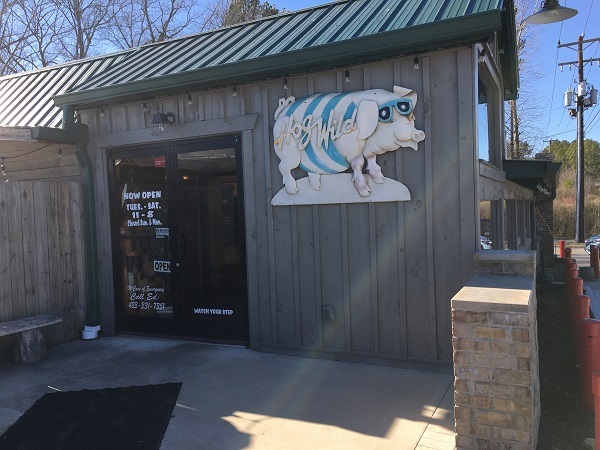 I think that independently-owned barbecue places here are pretty rare, but this may be a clue that there might be a regional “mountain barbecue” tradition that could be thought separate from eastern Tennessee or western North Carolina. I wonder whether there are many other places in the area we could visit and see. All that said, I don’t particularly care for this style myself, nor were we all that fond of Herb’s, either. Even adding some mustard sauce – another uncommon sight around these parts – to the meat couldn’t save it. But I was really pleased with the hot slaw, which we find at more and more places in eastern Tennessee, not just the ones that serve barbecue. This was really good; mixing the sauced pork with the slaw made for an interesting combination of flavors. No, we’re honestly not fans, but we understand the appeal, and the side of me that loves variety was pleased to see, at last, something quite different from the norm. Posted on March 8, 2017 by Grant G.Posted in barbecue, tennesseeTagged barbecue, ocoee, tennessee.